Joint POW/MIA Accounting Command Hickam | | Nan, Inc.
For the families of the soldiers who don’t come home from the front lines of battle, an emptiness lingers deep within that does not wither with time. Unable to even have a “proper” funeral due to the lack of physical remains, the thought of closure and notions of their loved ones “resting in peace” diminishes down to wishful thinking. Nan, Inc. had the honor of building a “state of the art” facility in Honolulu, where its very purpose is to help these families in hopes that they may finally be able to reclaim their lost family members and lay them to rest. The $85 million Senator Daniel K. Inouye Defense POW/MIA Accounting Agency (“DPAA”) serves as a facility for identifying the remains of those who were deemed “MIA” or “missing in action.” Once the remains of a soldier is identified, the Government contacts the next-of-kin to present the remains to the family in a peaceful and tranquil “floating chapel” at the heart of the facility that offers the families privacy and closure. On the project was Nan’s very own engineer, Reggie Coballes, who spoke about the project which he deemed to be a “landmark project” in his career, his team’s career, and for the company as well. Walking up to the building, you will notice the unique construction where the underlying metal soffit panels reveal that each floor is larger than the lower floor. The precast concrete panels on the side of the building are designed with a complex relief pattern. A geometric-patterned aluminum trellis covers the walkways. The concrete-colored main entrance walkway is flanked by a water feature and black granite benches. As you get closer, you will see open lanais with glass balconies. You will also notice the large windows that span the structure, which allow the building to be naturally lit. There is also an open lawn area, called the Hero’s Green, where the facility conducts various ceremonies. Inside the building is a climate-controlled, well-lit environment, both comfortable and functional. Terrazzo flooring, quartzite countertops, wood paneling, metal and wood ceilings, glare-free glass in aluminum framing, aluminum guardrails, and stainless steel handrails are some of the modern finishes found inside. As you walk through the lobby, you will enter a central courtyard straight ahead. The open-air, landscaped courtyard is surrounded by a glass curtain wall. As you look up, you will see the family viewing room floating high above in the air, which overlooks the landscaped courtyard to promote a tranquil environment. This suspended family viewing room is connected structurally to the main building only by an entry walkway. Also overlooking the courtyard are open lanais with glass balconies. To access the upper floors, two passenger elevators and one freight elevator are available. There are also three stairwells to the upper floors as well. In addition to the numerous workspaces, laboratories, and ancillary facilities to support its mission, there are many amenities for the tenants to foster a positive and efficient working environment. There are ten restrooms and nine shower rooms with lockers, and the drinking water fountains are equipped with purified water bottle fillers. There is a nursing room, a dining room with a kitchen and large lanai, and other multiple break rooms in the building. DPAA went to great lengths to improve the quality of life for their workforce, and Nan, Inc. delivered a world-class facility to meet their customers’ needs. The DPAA building is LEED Gold certified. The most noticeable contribution to this certification are the 1,400 photovoltaic panels, which are collectively rated at 400 KW. In addition to the panels placed on the roof of the main building, additional panels serve double duty as shade structures for ten parking canopies. There are also four (4) electric car charging stations and preferred parking for both low emission vehicles and carpool vehicles. For those who choose to bicycle to work, there are bike storages close to the entrances. 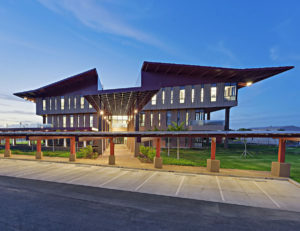 Part of the building’s mechanical system includes a Condensate Recovery System that provides makeup water for an outdoor water feature, along with a Grey Water System that provides landscape irrigation. While not easily apparent by its modern, contemporary exterior, there are many factors that contribute to this building’s high rating for environmental friendliness. The procedures and practices that contributed toward the Gold Rating were performed all throughout construction and now extends through the current operations and maintenance of the facility. In the 15 years that Reggie has been working for Nan, Inc., this is the kind of project he hoped to be able to work on. This ambition reflects the type of individuals who work for this company. From humble beginnings as a Government intern facing job cuts, Nan, Inc. provided Reggie with an opportunity to jump right in – no red tape, no weights to hold him down, only a path toward consecutively larger and more complex projects. “From that point on it’s been, ‘Hey Reg, can you do this?’ and I say, ‘Yeah, let’s do this!’ and working from there. Nan gave us the opportunity to make it our own from the beginning. And I’m sure that I can speak for many of us here when I say, you cut me and I bleed Nan, Inc.!” he said. Reggie is one of many Nan, Inc. employees who have dedicated themselves over the years, through economic growth and depression, through additions to both their own individual families and to the Nan, Inc. ‘Ohana, striving to represent the company in the best light possible. Nan, Inc.’s employees treat the company as if it were their own, and to be a part of this company is to be a testament of perseverance and commitment. This DPAA facility attests that Nan, Inc. is not only capable of placing concrete but that it is here to do so for the community, to make a difference as well as an impact. “I’m fully confident in our company’s abilities, and there’s nothing I would shrug away from, especially after the challenges we overcame on this last project,” Reggie said enthusiastically while praising the hard work and requisite dedication from each and every team member, who were all vital in accomplishing this spectacular milestone. With the mentality of Nan, Inc.’s engineers desiring an ever-greater challenge, along with the utmost work ethic and due diligence of its employees, the company and those behind it are realizing that it’s not only their work they’ve got to offer, but themselves and their humanity as well.